This entry was posted in Late War, USSR Events and tagged the reformer. Bookmark the permalink. If USSR wants to add 1 influence point in a country that is controlled by the US, does it cost 1 point or 2 points ? USSR can add influence in any country, or only in country adjacent to those where USSR has already influence? 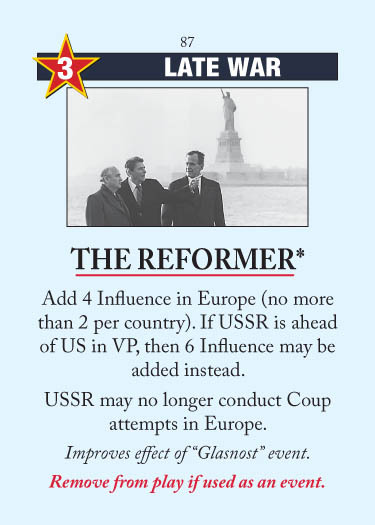 The Reformer adds influence directly. Any time an event says to “add influence”, it ignores the 2-for-1 penalty and adjacency requirements. Compare to Glasnost, which simply says “Conduct Operations as if they played a 4 Ops card” — if you use that to place influence you’re subject to the penalty and adjacency requirements.